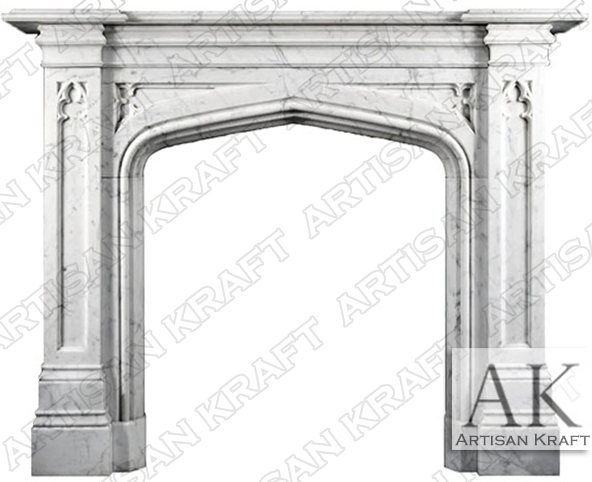 This is the Gothic Tudor English antique fireplace mantel surround. It is a fine example of our committment to quality craftsmanship with all our products. Pictured in Italian Carrera Marble. While the marble is from Italy the design is of distinct English stylings. A traditional peaked opening with step profiling frequent with both the Gothic and Tudor styles. Inset decorative paneling with just the right amount of detail. The inlay can be decorated with carving of leaves, roses and vines. Shields are another popular element that have been added. Some of our clients have requested family crests to be carved into the design. Antique Mantel Collection fireplace that deserves its place in that collection. More English style mantels can be viewed on our website. Stone: Marble, travertine, limestone, sandstone, precast.